Earlier today we reported that a few Best Buys were apparently selling the Verizon Galaxy Nexus even though there is no official release date from Verizon. Now, an AndroidCentral reader has gotten his hands on one of these devices and submitted an unboxing video. It is not know if this user acquired his through Best Buy or another source, but he definitely has one in hand and filmed the unboxing for all of our viewing pleasure. 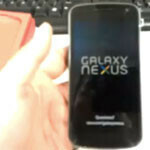 It seems that there is little question that the Samsung Galaxy Nexus on Verizon is locked and loaded. We are all just waiting for Verizon to give it the go. this is definitely within a verizon store in the back where they run technical support. Agreed. I was going to suggest that as well. Glad its in the stores and ready for release. phone looks lame and person thats speaking should speak more about the phone of what it can and cant do and also turn it on to show what it looks like and go through features. Why you don't believ it's a phone. It's the same as the one that's released but with LTE. If you want to know just look at the review of the gsm version or review of ics and you will get the experience of 99% of what's on the phone.